Expanding your vocabulary is an important but difficult aspect of learning a new language. One way to make it easier is to use color coding techniques, which can facilitate the vocabulary acquisition process. In the following article, you will learn why color coding improves your memorization abilities, and see how you can implement it in your learning. In general, color-coded material is a more effective study aid than black-and-white material, because it helps you process new information as you’re learning it. In the case of learning a foreign language, studies found that color coding new vocabulary words helps people learn those words better. While there are several possible mechanisms which could explain this improvement, the overall consensus is that color coding new information increases the chances of that information being “encoded, stored, and retrieved successfully” by learners. This highlight the value of color-coding techniques, and suggests that learners can use them in order to enhance their vocabulary-learning process. How to categorize the words that you color-code. First, you need to decide according to which criteria you are going to color the different words. Common options are grammatical gender (e.g. masculine/feminine) or part of speech (e.g. noun/verb). In languages with tonality (such as Mandarin Chinese), you can also color syllables according to their tone. Which coloring scheme to use. Once you choose based on which criteria to color-code the words, you need to decide how to color them. This can often be an arbitrary decision, so use whichever coloring scheme makes sense for you. If possible, use colors that you would intuitively associate with the categories in some way. For example, if you color-code words based on their grammatical gender, you might want to color feminine words in pink, and masculine words in blue. Another example is to use one set of similar colors for adverbs and verbs and a different set for adjectives and nouns (e.g. light/dark green and light/dark blue), in order to help you make the necessary associations. How to color the words. There are various ways to do this, including writing the color-coded words in an appropriately colored font, highlighting the words in an appropriate color, and writing the words on colored sticky-notes or flashcards. Note that you can also decide which words to color-code based on how familiar you are with them. For example, over time you might decide to only color new vocabulary words that you encounter in a text, while leaving old words that you already know in a default, neutral color (e.g. black). This could help draw attention to the new words, and might facilitate their acquisition. 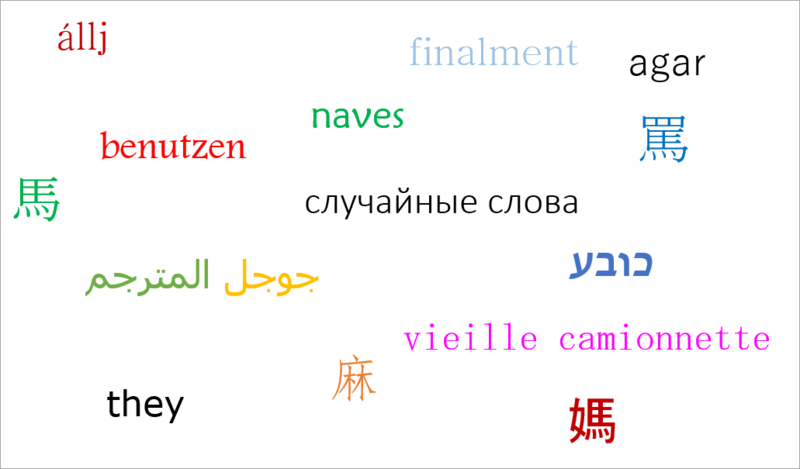 Below are a few examples of color-coded words in various languages, which represent some of the ways in which you can implement color coding. L’enseignant fâché cuisinait dans la vieille camionnette. The angry teacher cooked in the old van. La madre rubia finalmente consiguió sus naves. The blonde mother finally got her ships. Color-coded material is generally a more effective study aid than black-and-white material, because it improves your ability to encode, store, and retrieve the material that you’re trying to learn. Language learners can use color coding in order to improve their ability to learn new vocabulary words in their target foreign language. When color coding words, you first need to decide how to categorize the words; common options are grammatical gender (e.g. masculine/feminine) or part of speech (e.g. noun/verb). In some languages, you can also color other linguistic particles aside from words, as in the case of Mandarin Chinese, where you can color syllables according to their tone. You also need to decide which coloring scheme to use. Try to use a scheme that involves colors that you intuitively associate with the categorization scheme that you chose. For example, if you chose to color-code words based on their grammatical gender, you might want to color masculine words in blue, and feminine words in pink. The greatest advantage of color coding techniques lies in the fact that they are versatile, and can be easily implemented regardless of which vocabulary-learning strategy you decide to use overall. As such, you can integrate them into your learning in various ways, from using colored vocabulary flash cards, to highlighting, in specific colors, new words that you encounter as you read a foreign-language text.